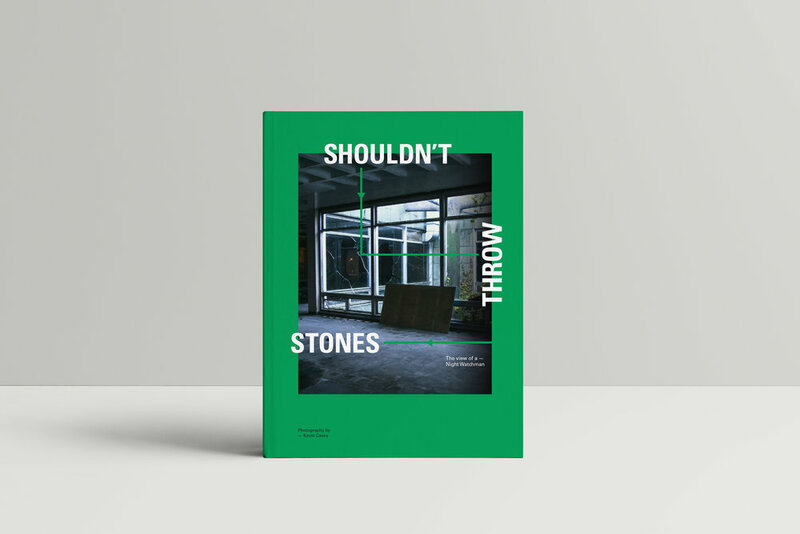 Shouldn't Throw Stones - The view of a Night Watchman is a 2 year documentary project produced by Photographer/Artist Kevin Casey. Casey creates work for commission in both commercial and Fine Art practices. Trying to survive as a practising artist and provide for a family is an increasingly difficult task to do in todays culture. Because of this Kevin has had to take a variety of jobs to gain a regular income and try to sustain a creative practice. He has been working as a Night Watchman/Security guard at the ex HQ of what was a Glass manufacturing Empire 'Pilkington's' in St Helens Merseyside. He has documented his role as a Night Watchman and the working life of the current employees that still remain on the 32 acre complex. He has also collected archive materials of what remains from the glass industry artefacts left on site. The book is a reflection of the role of a night worker, the U.K. manufacturing industry, the role of trying to sustain as a contemporary artist/photographer and an exercise in recovering and documenting archive materials. All archive materials have been provided by Alexandra Business Park.